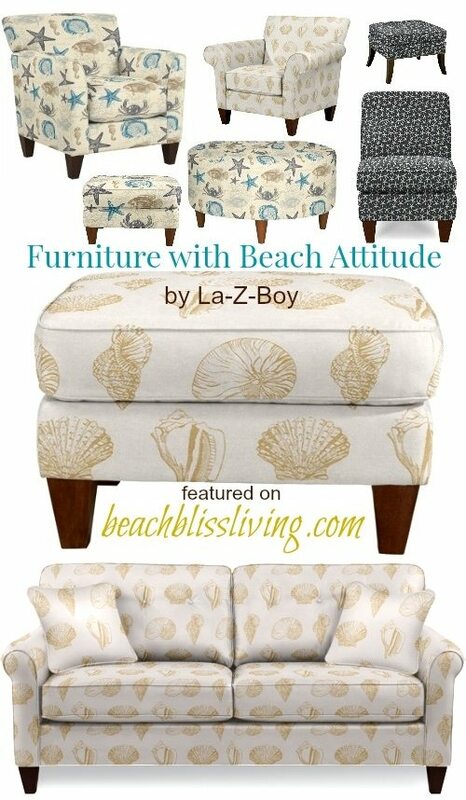 La-Z-Boy’s line of comfy chairs and ottomans can be ordered upholstered with beach attitude. Their novelty line of fabrics includes three choices for beach bliss living! 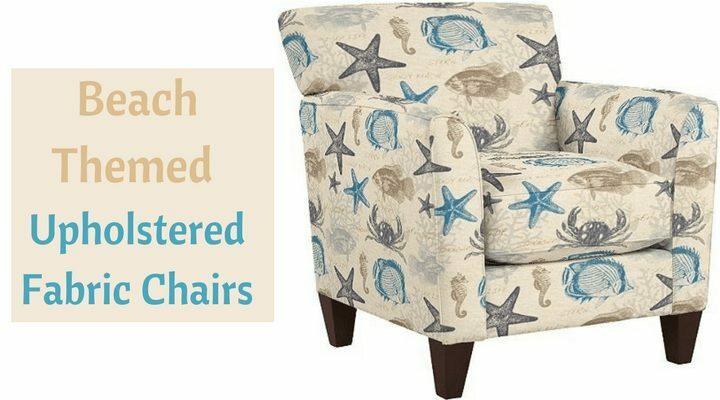 Have a chair and/or ottoman (or even a sofa) upholstered with a starfish/sea life fabric, seashell fabric, or dark blue & white starfish fabric. Many La-Z-Boy Chairs are your classic simple cushy upholstered chairs, such as the Allegra chair (in the first picture), followed by the Aria and arm-less Ari. 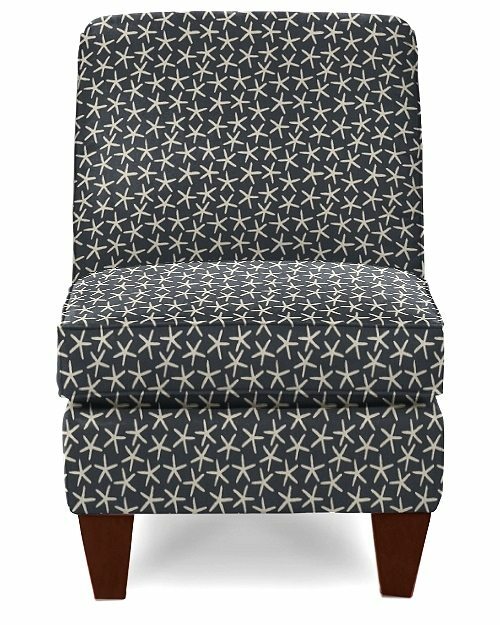 The streamlined look of these upholstered fabric chairs (starting at $559) goes with many decor styles. And the beach attitude is not shabby, isn’t? 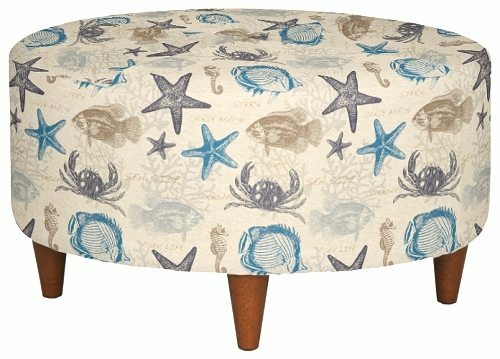 I especially adore the starfish/sea life chair that spells out words such as sandy beach. But the more neutral and soft seashell fabric is really lovely too. And the dark blue starfish design is fun and lively. 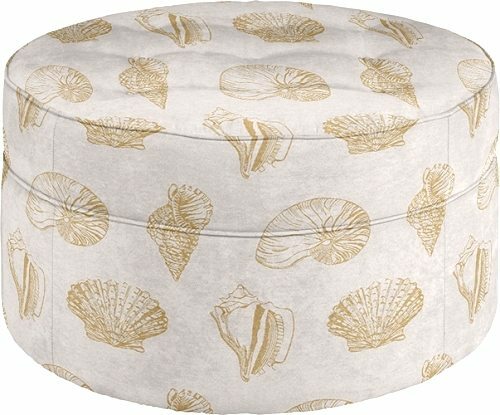 For extra comfort, to kick up your legs, you could get the matching ottoman too! Or get an ottoman alone. 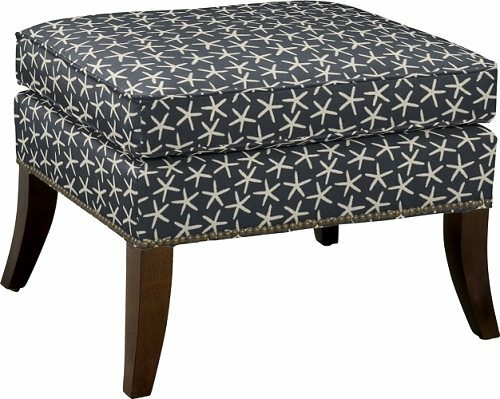 La-Z-Boy has quite a selection of Ottoman Styles to choose from, beginning in the three hundred range. Some models are on sale right now, until August 18th! 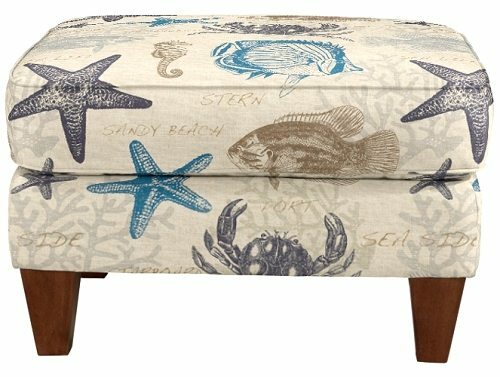 A single beach ottoman would bring a fun beach vibe to a living room, foyer or even a master bathroom. Or want to go big? Check out their Sofas! To order and select custom details visit your local La-Z-boy store (online or in person). The exact price will depend on your specific choices. La-Z-Boy products are made in America with US and imported parts. So whatever you purchase, a beach chair, ottoman, or perhaps even a sofa, it should last you a long time. Tip: Get insider information in the customer comment section. A good source for feedback on products, no matter what you buy, are customer comments. I always read them (if available) before I click the purchase button on a more expensive item. You get additional information about overall quality, color “trueness”, issues that could arise, and more. Are these chairs still availabl. If so I want one. How do I get one? I’m looking for a chair similar to the first photo at the top of the page. Except it’s blue with starfish. I can’t find it on any site and wondered if you had it? I saw it on Pinterest but their link wasn’t correct. Thanks! This is the chair I’m looking for. 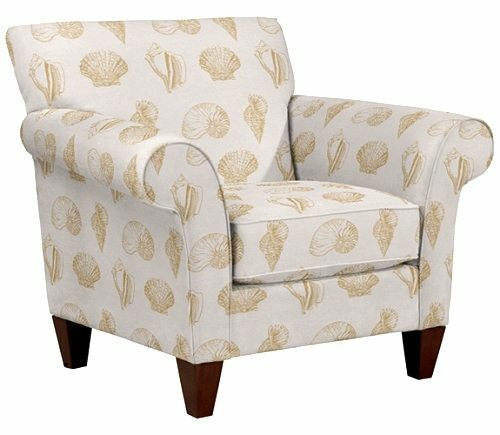 Do you know what store in Myrtle Beach I could find this chair? Thanks!